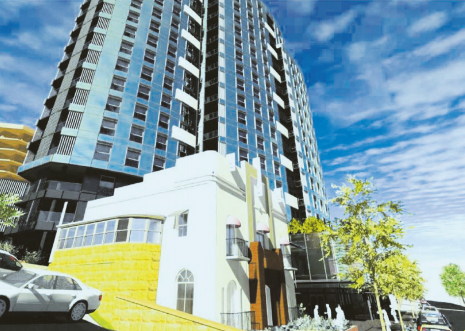 The $53 million Rola Property Group’s mixed-use development at 27 to 37 Mann St and 125 Georgiana Tce, Gosford, which included the heritage-listed Creighton’s Funeral Parlour, was approved by the Joint Regional Planning Panel on December 15, 2016. By a vote of three panel members to two (and one abstention due to a perceived potential conflict of interest), the Central Coast JRPP gave consent, signed off the following day by the Central Coast Council, for the demolition of existing structures, retention and adaptive reuse of the Creighton’s Funeral Parlour heritage item and erection of a new 18-storey retail, commercial, restaurant and residential development with 132 units and 205 car spaces. The original development application was lodged with the former Gosford Council in August 2014 and was resoundingly rejected by the community and other stakeholders, including the National Trust, for the DA’s failure to incorporate the preservation of the Creighton’s building.